EDClass + was developed again with the Senior Leaders, Head Governor and CEO of the Rodillian Multi Academy Trust to educate all those students that were not attending the 6 schools within their trust within specific times and periods of the day. Their staff and our staff work with their students to give them support and assistance online whilst following a personalised learning pathway. Their target was simple: Educate all within their trust through an application regardless of barriers. EDClass+ is a combination of EDClass and EDVirtual (Your staff using our Virtual Classroom platform). Within EDClass + our qualified teachers work with your teachers, using our online platform and our virtual classrooms to educate the students at your provision. EDClass+ can give education providers the option of using EDClass+ to combat staff timetable clashes and staff absences. Your facility can benefit from our qualified online staff concentrating on educating your short term off-site students, leaving your staff free to educate your longer term students, such as pupils that suffer with mental health problems. Students will benefit from qualified and experienced teachers using our tailor made learning pathways to give your students the best learning opportunities that are available in a virtual learning environment. Our unique safeguarding tools have been developed with these students in mind to give educators the best opportunity to deliver lessons to off-site students whilst monitoring their behaviour and safety. All virtual lessons can be streamed live for teacher viewing and are also recorded and automatically backed up and saved to ensure safeguarding all round. Our tutors provide support for students in exclusion, home education, isolation or in inclusion whilst they are on-site or off-site. 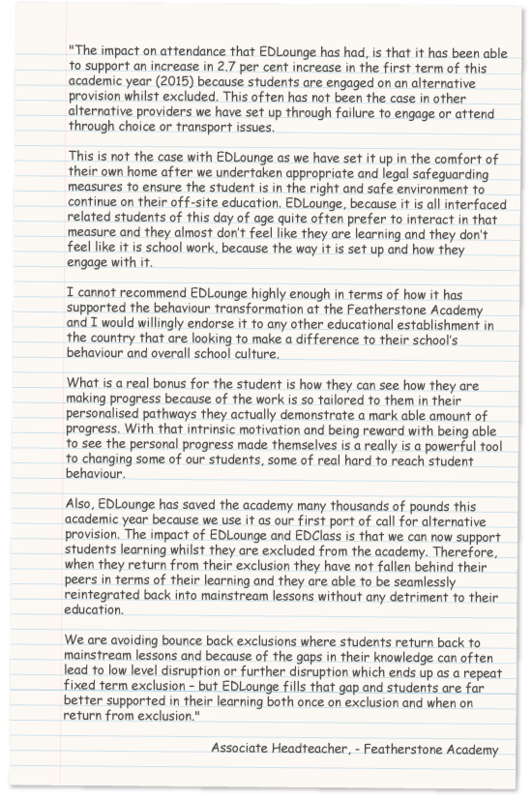 Students are able to ask for and receive help, feedback, comments and direction from our support officers, meaning that all students can progress through EDLounge. EDClass is the virtual learning platform which has been operational for the last 2 years. EDLounge teachers will support your students whilst they are using our learning platform and our learning pathways to educate your students. In 2014, we launched our remote learning and online support / supervision platform known as EDClass so that we can cater for all your students, teaching assistants, senior leadership and parents’ needs. Within this support and supervision mechanism we offer tutoring, assessment, pre-assessment, verification, and expertise in any subject for any age group. We offer support and supervision to any individual that is on the system, whether they are on-site or off site and undertaking theory, practical, knowledge or academic lessons. All our support officers are uniquely trained to have a wealth of knowledge and understanding of the EDLounge system, including lessons, qualifications, methodology, exams, coursework, and practical elements, enabling the student to continually learn and progress. Our expert support officers have an extensive knowledge of the qualifications we offer and put into place an exclusive pre-assessment, assessment and feedback service for the students alongside safe supervision.To help with the qualifications, a range of practice, live and mock exams are available for the students to prepare themselves for their BTEC courses. We cater for every aspect of the next generation BTEC courses and we offer a comprehensive support mechanism for the students undertaking these.